Today is the release day for awesome and super-sweet author Kay Cassidy! Jess Parker is a go-get-em type of person. She's always around to volunteer her time to worthy causes and charities, but when it comes to her social life, she flies under the radar. Her family is constantly moving, so she never really makes any friends. And when her family moves to her mom's hometown, Mt. Sterling, her social status plunges even farther due to Jess taking the meanest and one of the most popular girl's spots on the cheerleading team. Bullied and miserable, Jess never expects an invite from one of the most exclusive secret societies, The Cinderella Society. But before she knows it, her fairy godmother of a cheerleading captain has transformed her from shabby to chic, and she's learning how to lead a more positive life. But it won't be easy—the Wickeds (including her archenemy) aren't about to let the Cindys win, nor are they above using regular, innocent people to do it. Kay Cassidy's The Cinderella Society is a divine, delightful read that's just as much about empowering yourself and sticking up for what's right as it is about the romance and fun stuff. 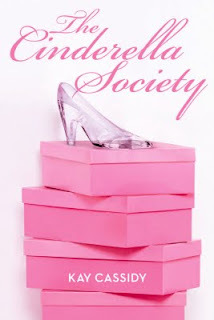 What makes this book so fun is the Cinderella Society, a secret group that is surprisingly extensive and super secretive, which is an element that will certainly attract readers who are also fans of Ally Carter's Gallagher Girls series. Cassidy also populates her book with realistic, down to earth characters, many who are popular and nice, and genuinely care about doing the right thing, not the latest designer item or the juiciest bit of gossip. These positive role models are a breath of fresh air, a relief from the numerous catty and snarky popular girls that tend to be popular in YA. The message in this book is also genuine. Cassidy doesn't have any skewed perceptions of perfection, or tell readers you have to change yourself in order to be a better person; instead she focuses on showing readers that by being yourself and discovering who you want to be, you can become the best that you can be. Full of fun secrets and some surprising twists, The Cinderella Society is a novel about choices and their affects and about being positive and true. Cover Comments: The cover is fun and pink and flirty, and it fits the title well, but not so much the book. Still, it is one that will stand out, and it works! ARC received from Egmont USA. Sounds very cute and like a good read!! I'm adding it to my To-Buy List!! !